We feel extremely privileged to present the fully revised second edition of the Venu-Gita, translated from the Hindi commentary written by our beloved Gurudeva om visnupada paramahamsa parivrajakacarya astottara-sata Sri Srimad Bhaktivedanta Narayana Maharaja. The first English edition, which appeared in 1995, was a compilation of the direct transcriptions of a series of lectures which our exalted Gurudeva had spoken in English several years before. The Hindi rendition, inspired by the English version, is the result of his deeply studying the commentaries of Srila Jiva Gosvami and Srila Visvanatha Cakravarti Thakura. He was so pleased with the Hindi rendition that he ordered it to be translated into English and published as soon as possible. 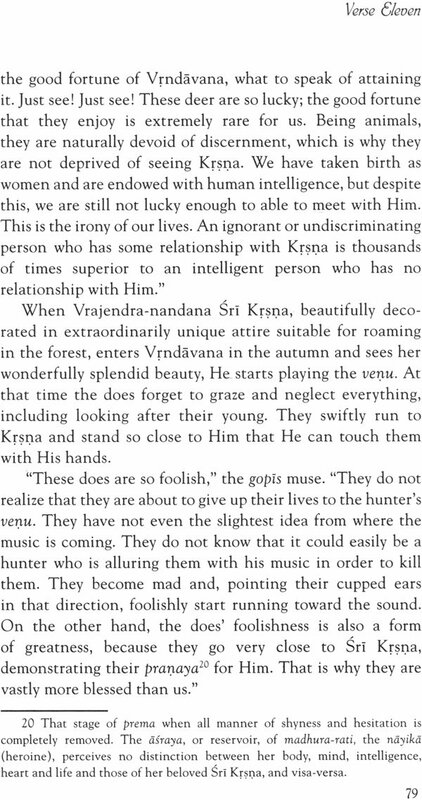 The new English version flows much more smoothly than the original and convincingly captures the very charming sentiments stimulated in the hearts of the vraja-ramanis when they hear the sweetly alluring song of Sri Syamasundara's flute. This book is a unique and invaluable contribution to our authentic Gaudiya Vaisnava literatures. If any sincere person reads it with an open mind, his heart will surely be attracted and infused with the desire to seriously cultivate vraja-bhakti. The introduction is also significant with its presentation of many authentic proofs in establishing what is the qualification to hear these confidential topics and in asserting that it is actually our duty to hear them from bona fide Vaisnavas in our disciplic line. 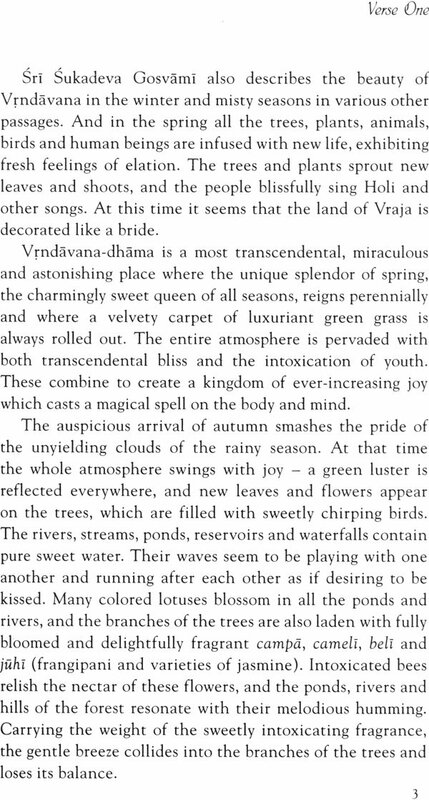 Presenting many charming descriptions of the moods of the gopis who speak the Venu-Gita, this grantha is a beautiful and priceless gift given by our venerable Gurudeva to the sadhaka who is aspiring to doraganuga bhajana. This translation is the fruit of a large cooperative effort. 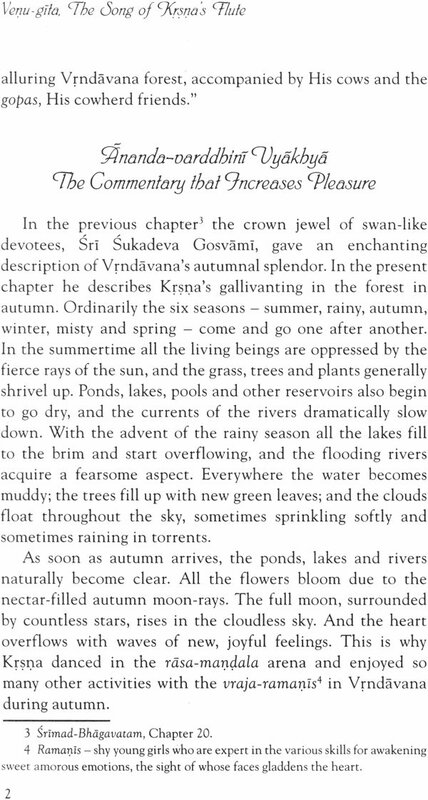 All of us from Srila Gurudeva's flourishing garden who helped bring this book to press are grateful to have been engaged in this elevated and exhilirating seva. Please excuse any mistake that may have slipped by us. We humbly pray at the lotus feet of our beloved and magnanimous Gurudeva, whom Sri Caitanya Mahaprabhu has sent to sprinkle the whole world with sva-bhakti sriyam, that he will be pleased with this English presentation of his Hindi words. We entreat that very soon he will also fill our hearts, which are harder and drier than any piece of bamboo, with his same deep loving sentiments for Sri Sri Radha-Krsna yugala. Srimad-Bhagavatam is a direct manifestation of the Supreme Lord. It is an ambrosial, overflowing ocean of supremely sweet nectarean love (prema-rasa) for the original Supreme Personality of Godhead (Svayam Bhagavan), that is, Vrajendra-nandana Sri Krsna, the personification of divine mellows. Rasika and bhavuka devotees! absorbed in tasting the beauty of Krsna's pastimes, always drown in this ocean. Srimad-Bhagavatam is the fully ripened, juicy fruit of the desire tree of Vedic literature that comprises the entirety of Indian thought. Within Srimad-Bhagavatam, gopi-prema, the love of the cowherd maidens of Vraja, has been ascertained to be the ultimate objective. 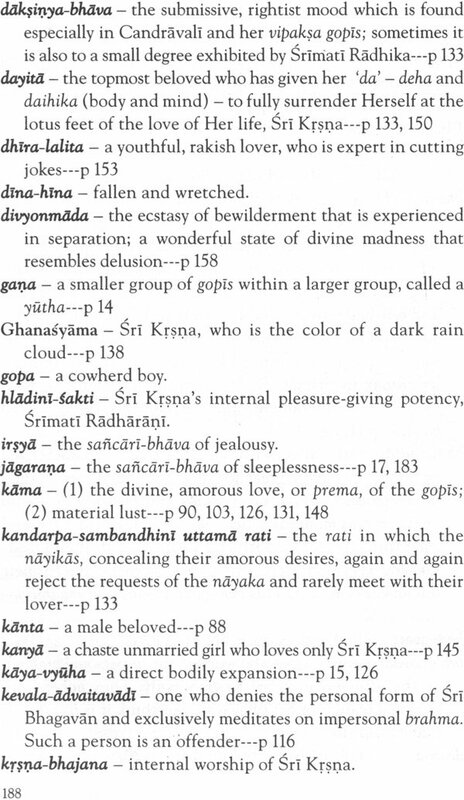 A few towering waves of gopi-prema can be seen from the Venu-gita portion of Srimad-Bhagavatam. Rasika devotees, who are seasoned in experiencing divine loving sentiments, drown themselves in these waves and even lose all consciousness of their own bodies. Greed to be immersed in this ambrosial ocean sprouts also in the hearts of the faithful devotees who are situated on the shore of this ocean. Sri Caitanya Mahaprabhu, the combined form of rasaraja (the King of divine mellows) and mahabhava (the Queen of divine love), resplendent with the sentiment and bodily complexion of Sri Radha, relished the nectar of Venu-gita with Sri Svarupa Damodara and Sri Raya Ramananda in SrI Gambhira. 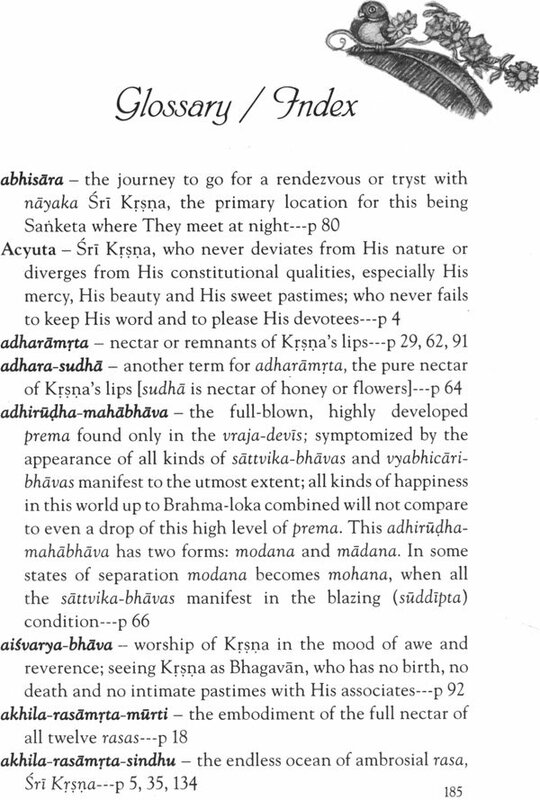 Srila Sanatana Gosvami and Srila jiva Gosvami collected a few drops of this nectar in their commentaries on Srimad-Bhagavatam, entitled Brhad-vaisnava-tosani and Laghu-vaisnava-tosani respectively. Srila Visvanatha Cakravarti Thakura, through his commentary named Sarartha-darsini, has distributed to the whole world that same nectar in the form of remnants of their mahaprasada. Some persons believe that unqualified sadhakas (spiritual practitioners) are ineligible to hear, chant or remember the topics of Sri Venu-gita, Sri Rasa-pancadhyayi, Yugala-gita, Bhramara-gita and so on, as described in the Tenth Canto of Srimad-Bhagavatam. This consideration is fully legitimate. But according to their conception, only a sadhaka who has conquered the six urges (lust, anger, etc. ), who is free from all anarthas (mean, selfish propensities) and fully purified of the heart disease of lust is eligible to hear such topics, while all others have no right. We will now examine this topic in greater detail. "The esoteric and confidential conclusions regarding the amorous pastimes of rasaraja Sri Krsna with the gopts (the cowherd maidens of Vraja who embody the highest sentiments of divine love) are not fit to be disclosed to the common ordinary man. But without revealing them, no one can enter into this topic. I shall, therefore, describe these topics in a concealed manner so that only rasika devotees will be able to understand, whereas ineligible fools will not. "Anyone who has established Sri Caitanya Mahaprabhu and Sri Nityananda Prabhu in his heart will attain transcendental bliss by hearing all these conclusions. 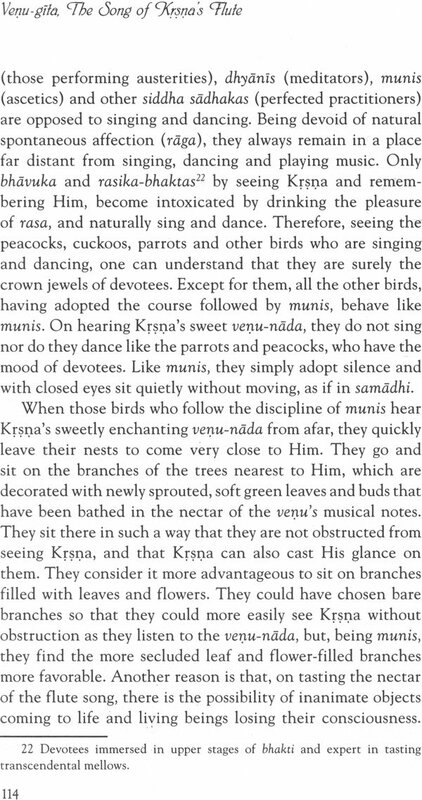 This entire doctrine is as sweet as newly grown mango sprouts, which can be relished only by devotees, who are likened to cuckoo birds. For the camel-like non-devotees, there is no possibility of admittance into these topics. Therefore, there is special jubilation in my heart. If those whom I fear are themselves unable to comprehend these topics, then what could be a greater source of happiness in all the three worlds? Therefore, after offering obeisances to the devotees, I am revealing this subject without any hesitation." "In order to bestow mercy upon the devotees as well as the conditioned souls, Bhagavan Sri Krsna manifests His human-like form and performs such extraordinary pastimes (rasa-lila) that anyone who hears them becomes exclusively devoted unto Him." 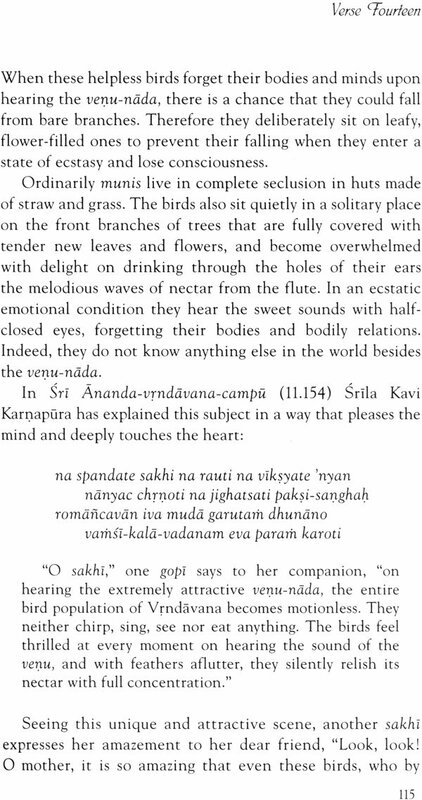 (quoted in Caitanya- caritamrta, Adi-lila 4.34). "In this verse bhavet is in the imperative mood. Therefore, this certainly must be done. To not do so would be a discrepancy." 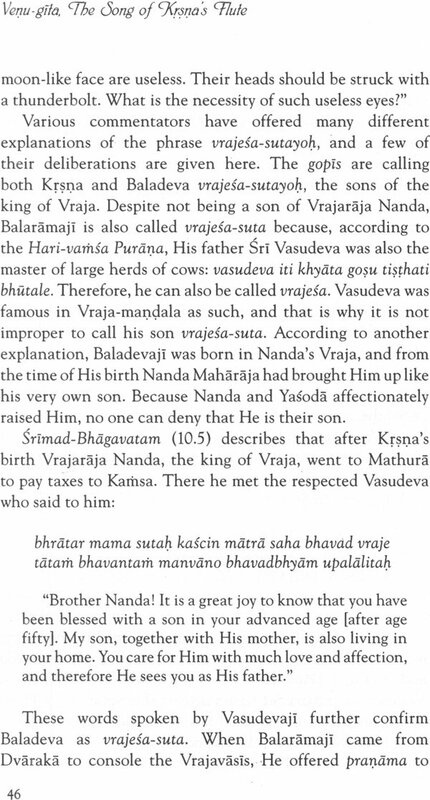 For the information of the reader, I am referring here to Srila jiva Gosvami's Vaisnava-tosani commentary on the above quoted Srimad-Bhagavatam verse (10.33.36). The words anugrahaya bhaktanam manusam deham asthitah indicate that the Supreme Lord Sri Krsna appears in His original human-like form and performs various pastimes in order to bestow favor upon His devotees. Therefore, although Sri Krsna is satisfied in Himself (apta-kama), His display of kindness toward the devotees is quite appropriate. This is the distinctive characteristic of visuddha-sattva (pure spiritual goodness). The Lord is always prepared to reward the devotees with a result consistent with their performance of bhajana (worshipful service). The favor shown toward King Rahugana by Sri jada Bharata and the Lord's favor toward Sukadeva Gosvami illustrate this. In the verse under discussion, it is said that the Lord manifests His form and pastimes in order to bestow favor upon His devotees. The word bhakta (devotee) used here refers to the vraja-devis (the gopis), the Vrajavasis (the residents of Vraja) and all other Vaisnavas - past, present and future. In order to bestow favor upon the vraja-devis, the Supreme Godhead Sri Krsna lovingly engages in such pastimes as purva-raga (the loving attachment experienced in anticipation of meeting Krsna). To bestow mercy upon all the residents of Vraja, He enacts His birth and other pastimes, and by all His activities He bestows favor upon past, present and future devotees through the medium of hearing narrations of His divine pastimes. Sri Krsna manifests all these pastimes to benefit the devotees. By doing so, even ordinary persons (other than the devotees) who hear even the more common of the Lord's pastimes become fully intent on the Lord. Therefore, by hearing the supremely ambrosial rasa-lila, Sri Krsna's circle dance with millions of gopis, such persons will certainly become exclusively devoted to the Lord - of this there can be no doubt. This fact will be elaborately discussed in sub- sequent verses, such as vikriditam vraja-vadhubhir idam ca visnoh (.Srlmad-Bhagavatam 10.33.39). We feel extremely privileged to present a revised third edition of the Venu-gita, translated from the Hindi commentary written by our beloved Gurudeva om Visnupada paramahamsa parivrajakacarya astottara-sata Sri Srimad Bhaktivedanta Narayana Gosvami Maharaja. The first English edition, which appeared in 1995, was a compilation of the direct transcripts of a series of lectures that our exalted Gurudeva had spoken in English several years before. The Hindi rendition, inspired by the English version, is the result of his deeply studying the commentaries of Srila Jiva Gosvami and Srila Visvanatha Cakravarti Thakura. He was so pleased with the Hindi rendition that he ordered it to be translated into English and published as soon as possible. 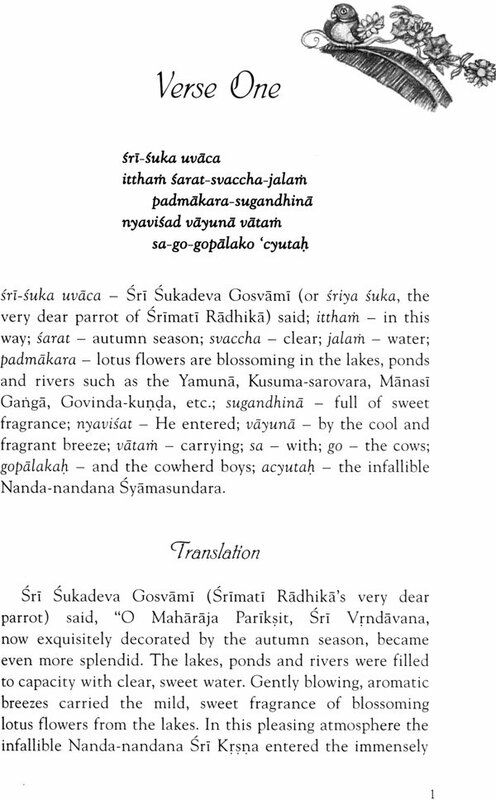 The second English version, published in September, 1999, flowed much more smoothly than the original and convincingly captured the very charming sentiments stimulated in the hearts of the cowherd damsels of Vraja when they hear the sweetly alluring song of Sri Syamasundara's flute. 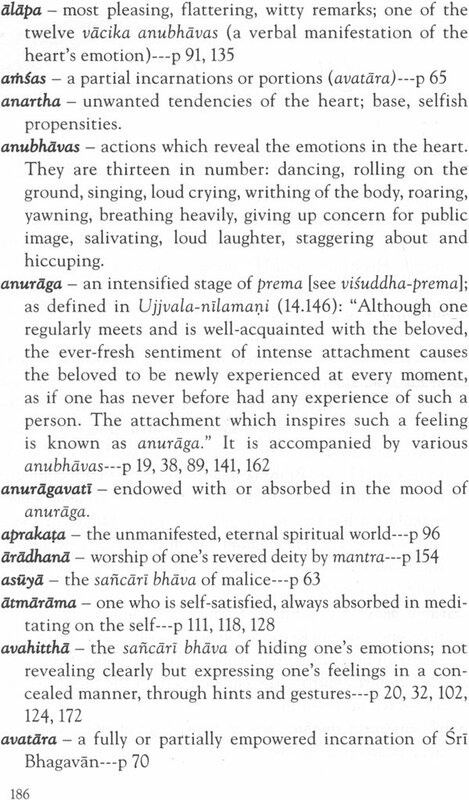 And now the third edition attempts to refine the language and open up the meanings of the many Sanskrit terms that define the bhakti experience. This book is a beautiful and priceless gift from our venerable Gurudeva to the practicing devotee who is aspiring to do raganuga-bhajana, service in the mood of spontaneous love. 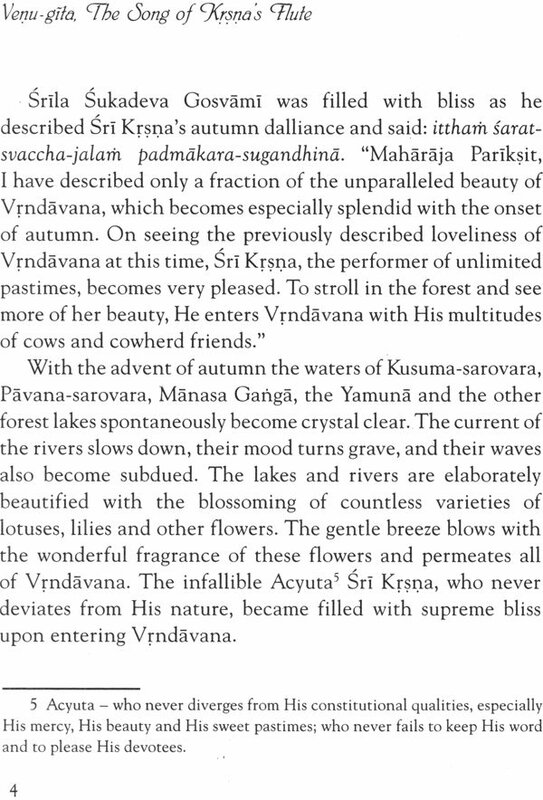 Presenting many delightful descriptions of the moods of the gopis who speak the Venu-gita, this sacred text effectively reveals the innocence in the hearts of the Vraja milkmaids, who know only their supernal sweetheart, Vrajendra-nandana Syamasundara. The vision of this innocence, purity and fervent devotion will surely have a powerful effect on the reader, increasing his faith and instilling in him the desire to seriously cultivate bhakti in the wake of Krsna's beloveds. The introduction is also significant with its presentation of many authentic proofs that establish the qualification to hear these confidential topics. The conclusion of all these references is that it is actually our duty to hear these discussions from bona fide Vaisnavas in our disciplic line, even while we are still plagued with extraneous desires. Indeed, our acaryas have informed us that hearing about Krsna's pastimes with the beautiful damsels of Vraja is the apt medicine for healing the blemished heart. This translation is the fruit of a large cooperative effort. All of us from Srila Gurudeva's flourishing garden who helped bring this book to press are grateful to have been engaged in this elevated and exhilarating service. Please excuse any mistake that may have slipped by us. We humbly pray at the lotus feet of our beloved and magnanimous Gurudeva, whom Sri Caitanya Mahaprabhu has sent to sprinkle the whole world with sva-bhakti sriyam (intimate service to Sri Radha), that he will be pleased with this English presentation of his Hindi words. We entreat that very soon he will also fill our hearts, which are harder and drier than any piece of bamboo, with his same deep loving sentiments for the Divine Couple, Sri Sri Radha-Krsna Yugala. Weight of book 403 gms.